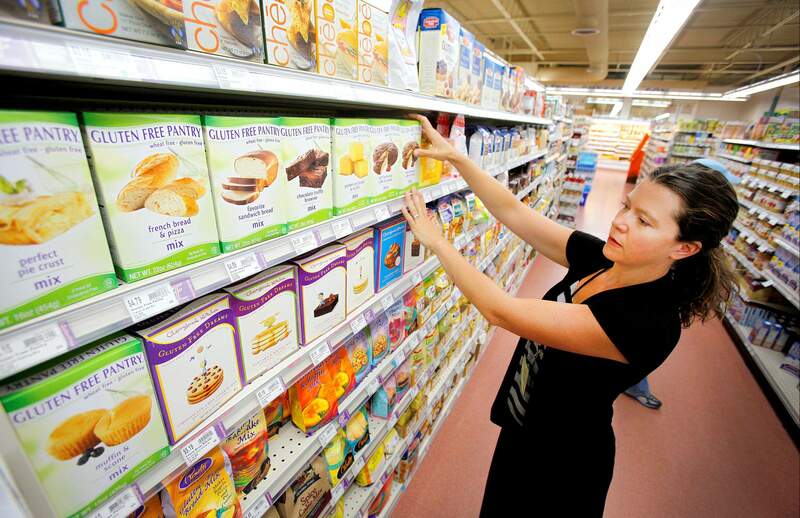 Tiffany Stombaugh, health coach at Natural Grocers in Durango, arranges a shelf of gluten-free cereal. While gluten-free products are interspersed throughout the store, the cereal and cookie aisle is full of them. 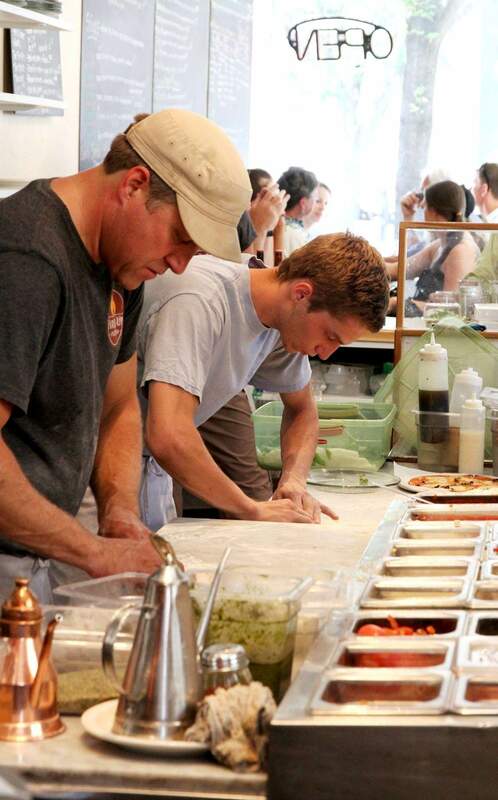 Tad Brown, owner of Fired Up Pizzeria, and Joshua Teigen put toppings such as mushrooms and basil on waiting pizzas. 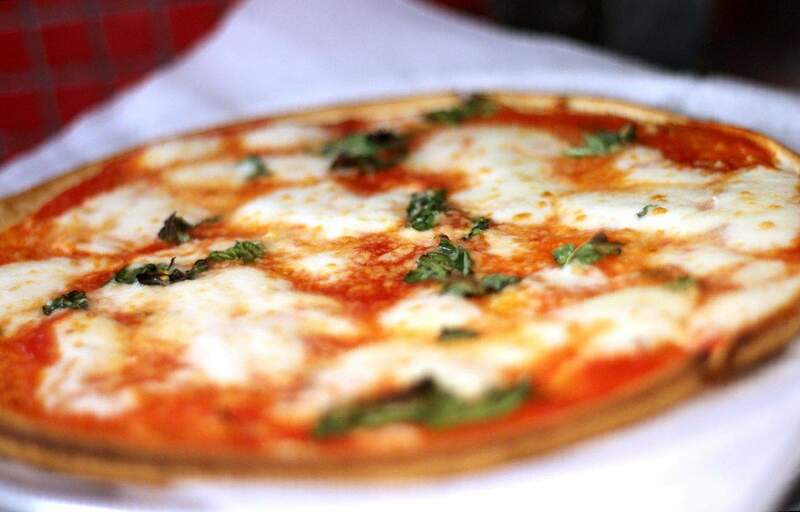 Fired Up Pizzerias freshly made gluten-free pizza also can be made dairy-free. 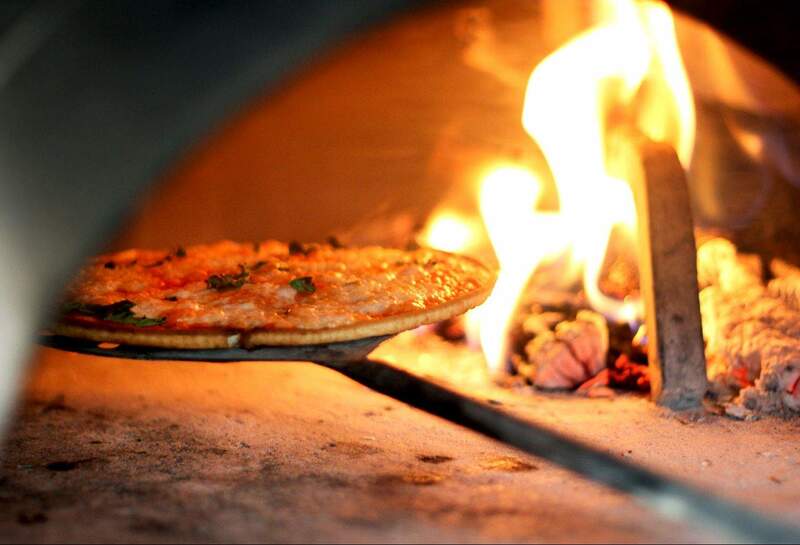 Gluten-free pizza cooks for just a few minutes at 900 F in the wood-burning oven at Fired Up Pizzeria. 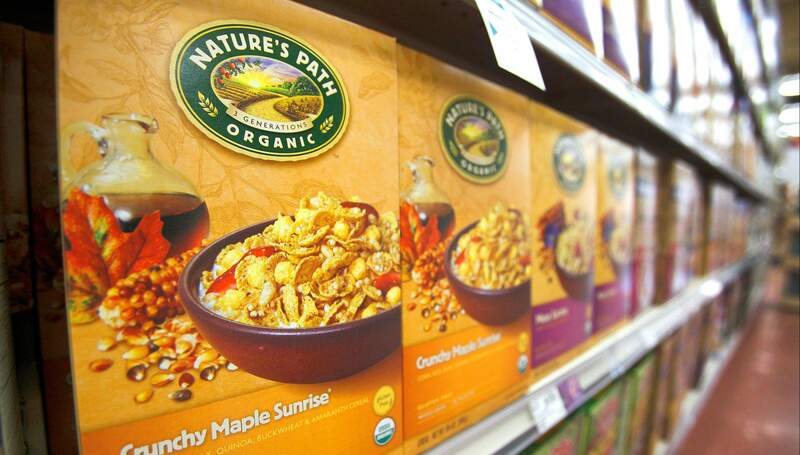 Gluten-free cereals are among the products for sale at Natural Grocers in Durango. Lets face it. Living without wheat is a pain. No sandwiches. No pizza. No pasta. Some days youd give your first-born for a fresh doughnut. Those are a few of the food limits you face at home. Travel for the gluten-free? Kill me. Airports are a gluten-only zone. Unless youre fortunate enough to find a place that sells a decent salad or a cup of yogurt, youre done for. While the fast-food staples of the American diet are nutritionally dismal, thats all thats available when you fly. Breakfast muffins and burritos are off limits; hamburgers and hot dogs are a no-go; fried anything is a trip to hell and back. And those are the foods you know to avoid. God help you trying to ferret out ingredients that can light up your allergy like an Olympic torch  flour in the soup base, wheat in the soy sauce, malt in the seasonings. Ive learned to bring a carryall stuffed with enough rice crackers, peanut butter, foil-packaged tuna fish and trail mix to feed a roomful of toddlers. Its not three squares, but it will get you to your destination without fainting from famine. And when you arrive at your condo or hotel for a weeklong stay, what then? Fear not, visitors to Durango. You wont go hungry. Any fine-dining restaurant in town will accommodate you. Walk in, sit down at your table and say Im allergic to gluten, and presto, your troubles are over. Guidos Favorite Foods will offer you rice pasta. Cyprus Café will point out the many gluten-free dishes on its menu; a soft-shell crab sandwich at Seasons Rotisserie & Grill will miraculously become a soft-shell crab salad; the menu at Cosmo Bar & Dining notes to ask waiters about gluten-free dishes. But thats for the big spenders. For anyone on a budget, or heaven forbid, traveling with children, surprise! Durangos more affordable restaurants will take care of you as well. Theres no need to fall on your knees in gratitude that you and your family can dine on more than celery sticks and grilled chicken. Restaurateurs arent doing it out of the goodness of their hearts  theyre doing it because demand for dishes without gluten is skyrocketing. I tried the Wifey  mozzarella, mushrooms, olives, basil and parmesan  with the gluten-free crust. The crust spent about two minutes in the 900 F wood oven and turned out thin and crunchy rather than chewy and toothsome, but the toppings made it delicious anyway. Another thing to face up to when youre allergic to gluten: rice flour aint wheat flour. When substituting one for the other, you can only come so close to the original taste. Restaurants that ignore customers who have special diets face dire consequences, says Linda Illsley, owner of Lindas Local Food Café and Durangos queen of gluten-free cooking. She already sees a national trend toward fewer people eating out, she said, because they dont want to get sick. The menu at her small, bright restaurant in Albertsons parking lot is almost entirely gluten-free and affordable to boot, with even a hearty plate of chiles rellenos and rice and beans clocking in at under $15. For the sweet hound, she offers gluten-free desserts such as almond tea cakes and apricot muffins. Certain ethnic cuisines are a lifesaver for the gluten-intolerant traveler. Mexican food, which is based on corn, beans and rice, can be not just a safe haven, but an inexpensive option, as well. While Durango boasts many Mexican-style restaurants, both Zia Taqueria and Ninis Taqueria pay special attention to special-diet diners, keeping flour and corn tortillas separate and customizing dishes to be free of gluten (and dairy, if need be). Asian food is another natural respite from wheat-heavy American fare, centered as it is around rice, vegetables and fish. Theres a caveat, however. Some soy sauces include wheat, and many Asian sauces include soy. But the trend is changing. Its such a hot topic, Im able to find food products that are wheat-free now, said Sergio Verduzco, owner of East by Southwest, a pan-Asian restaurant featuring everything from Vietnamese noodles to scallop sashimi. Identifying gluten in dishes and sauces is becoming an industry standard. East by Southwest marks items on the menu that can be made gluten-free for a small charge. (The popcorn calamari are a rare fried treat, but again, crunchier than the wheat version.) Sizzling Siam, a primarily take-out Thai restaurant, lists its gluten-free dishes on a sheet at the counter, but many can be made gluten-free simply by substituting rice noodles for wheat. Theres another, all-too-common reason local restaurateurs go to extra lengths to provide food for the gluten-intolerant: many of them have family members who are sensitive to it, or they are themselves. Browns father, an investor in the pizza shop, is a vegan, so along with offering his gluten-free crust, he also gives customers a choice of soy cheese. Illsley doesnt eat wheat. And one of Verduzcos four children cant have it. That fact can be a mothers saving grace. When visiting an unfamiliar town, researching health food stores and restaurants online is the first order of business. Establishments that advertise their gluten-free options make a difficult situation better for a traveling family. In the places that provide the most choices, youll frequently find a gluten-intolerant chef or manager. For those staying with friends or renting a vacation home, the areas abundance of health food stores can instantly improve your life. An allergic child can feast on the gluten-free breakfast cereals, frozen waffles, salty snacks, cookies, pastas and prepared meals they stock on their shelves. Their deli bars offer gluten- and dairy-free salads and sandwiches (gluten-free bread is at hand) and even wheat-free breakfast wraps and gluten-free chicken nuggets. No muss, no fuss, no fighting over what they can and cant eat  a childs treat and a parents sweet relief. In Durango, even the gluten-intolerant can dine well and do what theyre supposed to do on vacation  relax. Traveling without being able to eat anything made from wheat, barley or rye  i.e., gluten  is more than a challenge, its a nightmare. Durango, however, offers more choices than most destinations for the gluten-intolerant. From fine dining to pizzerias, coffee shops to gourmet stores, Durango is stocked with places that allow you to eat well, cook well and snack well. Chimney Rock Farms, 500 C.R. 175, Bayfield, 731-1700, or at the Durango Farmers Market. Offers cheddar-jalapeño, multi-grain and pumpernickel breads, as well as brownies, snickerdoodles and ginger cookies. Serious Delights, 300 South Camino del Rio (inside Natures Oasis), 403-1517. Carries a tasty but weighty gluten-free coconut-lemon muffin, a coconut macaroon and an intense flourless chocolate cake. Wildflour Bakery at Durango Coffee Co., 730 Main Ave., 259-2059. Provides blueberry and chocolate-chip muffins and oatmeal-raisin cookies. All three carry a complete line of gluten-free products, including pasta, chips, bread and frozen foods, but Natures Oasis and Durango Natural Foods Co-op also have delis that produce gluten-free sandwiches and salads. Staff members happily serve as Durangos unofficial concierges for the gluten-intolerant. Cosmo Bar & Dining, 919 Main Ave., 259-2898. Will prepare many entrees without gluten if you ask. Offers gluten-free triple chocolate cookies or hot beignets for dessert (both wonderful). Cyprus Café, 725 E. Second Ave., 385-6884. Features varied Mediterranean dishes and meal-sized salads with notes on the menu indicating gluten-free items. They also will customize a dish to exclude gluten, if they can. Ore House, 147 E. College Drive, 247-5707. Known for its straight-up steak-house food, the simplicity of its preparations means gluten isnt used in many dishes and sauces. Seasons Rotisserie & Grill, 764 Main Ave., 382-9790, presents continental fare in a swanky atmosphere. Waiters are equipped with lists of the menus gluten-free dishes, and the kitchen often can tweak an item to make it gluten-free. Lindas Local Food Café, 309 W. College Ave., 259-6729. Provides an almost completely gluten-free menu, as well as wheat-free desserts. Ninis Taqueria, 552 Main Ave., 259-4221. Makes delicious tacos and salads with blue-corn tortillas. Zia Taqueria, 3101 Main Ave., 247-3355. Pays special attention to special diet requests and will help you build your own gluten-free meal at the taco bar. Sushitarian, 601 E. 2nd Ave., 382-0001. Provides a full gluten-free menu and offers many naturally gluten-free sushi and seafood dishes. Fired-Up, 1050 Main Ave., 247-0264. Offers a pre-made gluten-free crust to personalize with many fresh and locally sourced toppings. Iron Horse, 700 South Camino del Rio, Unit B, 259-9089. Prepares its own wheat-free crust on site and offers gluten-free sandwiches, too.